The all-analog Jim Dunlop MXR Analog Chorus pedal gives you a versatile and great sounding effect with many tweaking options. A welcome addition to the pedalboard of many guitarists, this pedal uses "bucket-brigade" circuitry to create luscious chorus effects the likes of which can't be achieved with a digital circuit. If you're after replicating big chorus tones this is the pedal for you. 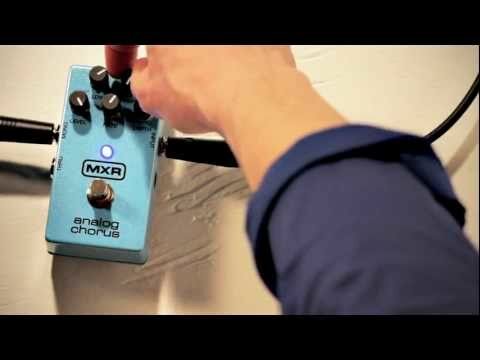 The Analog Chorus Pedal is capable of replicating tones from many different genres including Daft Punks Get Lucky and Walking on the Moon by the Police. The large array of controls gives you the ability to tweak and change every aspect of your desired chorus, while the all-analog circuitry ensures you are free from any digitised, artificial overtones. Used by the likes of Eddie Van Halen, Slash and The Vaccines, you can tell the MXR Analog Chorus effects pedal is ideal for a range of genres. The 5 controls on the front of the pedal are great for sculpting the signal and give you control over level, rate, depth and low and high frequency cuts.